The following article appears in the December 17, 1989 issue of The Oregonian of Portland, OR, and is Copyright © 1989 by The Oregonian. All Rights Reserved. 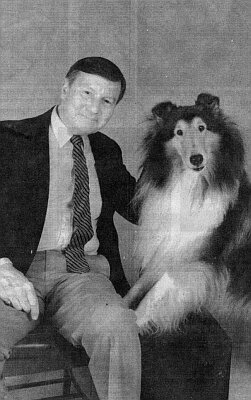 Writer Ted Paul and Toby, namesake of a main character in "The Christmas Collie," make public appearances on behalf of humane societies and programs to encourage children to read. 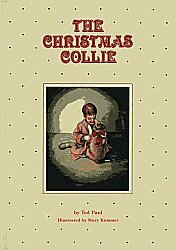 Ted Paul of Salem rolled his longtime loves of reading, writing and animals into a furry charmer called "The Christmas Collie." It's a new children's book about a 5-year-old boy, who receives a cuddly collie pup for Christmas. Nostalgic illustrations accompany the verses, which relate their experiences growing up together in a rural seting near Cleveland, Ohio. The boy in the poem is Paul and the dog is Toby, his first collie. During the past few weeks, Paul, 59, and the current Toby, a well-behaved and gentle former show dog, have appeared together at autograph signings in Colorado, California and Oregon. In addition, Paul and Toby have made public appearances in behalf of humane societies and conducted reading workshops for children at schools. If sales of the new book - 14,000 in the first three weeks - are an indicator, thousdands of children, especially in the West, will find copies of the book in their Christmas stocking. Paul said he has made many multiple sales to parents and grandparents, who tell him it reminds them of their own childhood pets. The book (Beautiful America Publishing, $9.95) is the culmination of Paul's lifelong interest in reading, collies and his present job. After a career in the paint and coating business in the Midwest, Paul and his wife, Beverly, moved to Oregon. In 1980, they established Beautiful America Publishing Co. in Wilsonville. They never had considered doing children's books until they were approached by several authors and illustrators. And then Beverly Paul dredged up some verse Ted wrote for a December newsletter 25 years ago when he was president of the Cleveland Collie Club. It was called "The Christmas Collie" and ended with Paul leaving his old pet to go into the Army during the Korean War. Paul addded onto the poem to give it a happy ending and called an old friend, Mary Kummer, an illustrator and sculptor in Sterling Heights, Mich., whom he considers the "best collie artist in the country." "The Christmas Collie" is Beautiful America's first Little America book, but others are in the offing. "The marvelous part about this is you can get your own picture." "I enjoy reading immensely. That is the thing that lead me into this project. I grew up when there was no television. There was reading. And there were radio serials that were imagination-provoking." Television, he said, doesn't encourage children's imaginations. Paul, who polished his speaking style while president of the Collie Club of America, is working on the problem. Teachers have told him that they have difficulty getting children's book authors to participate in school programs. But Paul, as time allows, keeps going back to the classroom. One of his techniques is to start reading a verse and then stop. The children finish the rhyme. "The marvelous part about this is you can get your own picture," said Paul. Getting children hooked on reading with animal stories is nothing new, according to Paul, whose early reading included Eric Knight's classic "Lassie Come Home" and Albert Payson Terhune's stories such as "Lad: A Dog" and "Dog of the High Sierras." Only recently did Paul learn that Terhune served as vice president of the Collie Club of America in the 1920s. Animals figure in other ways this season at the publishing company in Wilsonville. Four years ago it began producing color art calendars for varous organizations and businesses. This year it produced 1990 calendars for the Washington Park Zoo in Portland and The Friends of Animals in Norwalk, Conn.